Explore the pleasures of wine with our award-winning Wine School. Whether you are starting to explore or building your experience, our book gives you the tools to recognise, remember and enjoy wine. Featuring a foreword by Emma Thompson, our book focusses on the classic grape varieties that from the backbone of great wines the world over. For each grape there are innovative practical pages that best describe vital factors such as aroma, flavour and balance. Background pages to help broaden your understanding and discussions by our Masters of Wine and other experts. Decanter - The design is terrific, the presentation fresh… it’s fun and stimulating. Clever design and presentation packs a huge amount of information, well written, without any feeling of indigestion. A star buy. 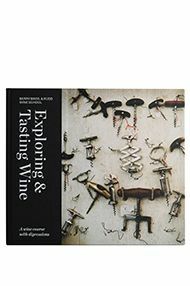 Other - I was really impressed by a book called ‘Exploring & Tasting Wine: A Wine Course with Digressions’, published by wine merchants Berry Bros & Rudd. I think that this book provides anyone learning about wine with a great new way of thinking about any given grape (and, by extension, any wine they taste). Exploring and Tasting Wine’ certainly breaks up a lot of information into digestible chunks, and finds a new way to communicate some of the criteria needed to assess wines with any degree of accuracy. If you want a visual metaphor (hey, it’s all the rage, apparently) you might think of this book as the training wheels a newbie to the wine world needs before they pedal off to acquire their very own expertise. I have to admit that I often describe wines in my aide-memoire tasting notes via the use of diagrams, I just don’t publish these impressions as this is not the accepted way of transmitting information about wines. Maybe, inspired by this book, I should re-think my position. Natasha Hughes MW, natashahughes.com ClerkenwellboyEC1 (top food commentator) in Observer Food Monthly: Exploring & Tasting Wine top of the pile of his favourite new food and wine books in his 112,000-follower Instagram feed. Moore - It is beautifully produced, very cleverly written so that it feels contemporary and fresh, delivering information succinctly and clearly. I particularly like the fact that, unusually for a wine book, it succeeds in making wine feel part of the real world. It has been carefully marshalled into shape to be appropriate for the 21st century, and it offers a genuine guiding voice, a sense that the information has been properly synthesized. I recommend buying it.